Apple CarPlay allows your iPhone to take over your car's infotainment system. In theory, it makes driving safer by bringing key – although limited – iOS functionality to the car's touchscreen. 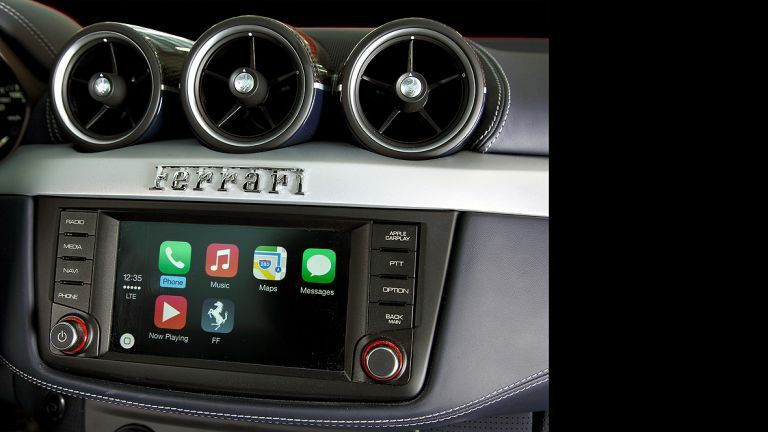 CarPlay launched last year, and Apple lists 34 car companies as partners, but Ferrari's California T and FF are the first to market. We're testing it as a £2,400 optional extra in the £230,000 FF. Yeah, we're showing off. The FF's touchscreen then displays familiar iPhone apps: Phone, Music, Maps and Messages. You can touch them, use the relevant physical buttons either side of the touchscreen, or scroll through the apps using the rotary dial at the screen's bottom right. You can't browse web pages or view emails, but other approved apps can be integrated with CarPlay, and automatically appear if downloaded to your iPhone. The range of apps is very limited, but will continue to expand and includes Spotify music streaming and digital-radio service Stitcher. With a variety of potential music sources available, the 'Now Playing' icon is a handy shortcut if you've forgotten which app you launched. All third-party apps are modified for in-car use while retaining a familiar appearance, and the focus is on simplicity and safety. So while you can scroll through existing playlists on Spotify, you can't search for new music – a great idea to improve road safety, but frustrating when you're in a car park and your iPhone's in the centre console. If you prefer Google Maps, Waze or other navigation apps, hard luck – only Apple Maps is CarPlay compatible. You can choose to manually enter an address, and the 'Destinations' icon lists recent destinations as well as addresses it finds in text messages, emails or your calendar – nice touch. Alternatively, use Siri voice control by pressing an icon on the touchscreen or a little button behind the steering wheel. Siri allows you to say an address aloud, or use much looser voice inputs. We found Siri's responses to looser inputs disappointing, and telling it I'd like a coffee opened a can of worms. At first Siri suggested just one place in Birmingham, while narrowing things down with a request for Costa coffee only highlighted the nearest outlet – the location I had in mind wasn't listed. Siri then tried to call the café when asked to find Costa coffee on Calthorpe Road, presumably misinterpreting the word 'find' for 'phone'. Only by saying "navigate to 60 Calthorpe Road" did I get our city-centre caffeine fix – if you don't know an address, you'd have to stop the car and check online. Despite its flaws, however, Siri is more intuitive than Ferrari's OEM voice-recognition system. Manually enter an address and the system works well, with clear voice instructions and turn-by-turn navigation, and it's intuitive enough to cancel route guidance, get a route overview or zoom in and out – though you have to press the + and – buttons to do the latter rather than pinching the screen. The Ferrari touchscreen's relatively low resolution combined with Maps' so-so graphics make it noticeably more dated than the best in-car systems. Maps is better than Ferrari's own dated alternative, but Audi's Virtual Cockpit infotainment is standard on the latest TT, for instance, and the screen resolution and graphics are simply in another league. And, remember, you'll be using data to navigate via CarPlay – potentially pricey on an overseas trip – and you'll need a good data signal. Press the Phone app and Siri automatically launches, or you can click the 'Show Contacts' icon in the top right of the touchscreen, giving a menu of Favourites, Recents, Contacts, Keypad, Voicemails, and the ability to scroll through those lists. Far safer, though, is to let Siri do the heavy lifting. No surprises here: ask Siri to 'call John' and it'll do the rest. It works, so long as you have that data signal. CarPlay can also read out and dictate texts. Receive a text and Siri will check if you'd like to hear it – a nice layer of security if you've got a passenger, but one that could lead to an awkward silence if you say no. To text a reply – or start a new text conversation – dictate the message to Siri. Siri reads the text back to you as a final sense-check, before asking if you'd like to send the message. It puts an end to those situations where a text comes in but you're busy at the wheel and either cave in to curiosity, or spend the rest of the journey fearing you've missed something urgent. CarPlay's inability to display texts can be frustrating, though. It feels logical to store your iPhone away because you quickly recalibrate to using the car's touchscreen. Then you park up and try to read through your texts, but can't. I found the same urge to check emails, only to be thwarted by the pared-back functionality. There's much to like about CarPlay, especially in cars at lower price points with limited connectivity. CarPlay is no harder to activate than plugging your phone in to charge, responds quickly to inputs and is mostly intuitive, being able to access multiple music sources without having to refer to your phone. Launching Spotify, for instance, is particularly welcome. Best of all, the ability to combine CarPlay functionality with Siri voice control is convenient and makes driving genuinely safer. But the restrictions imposed by Apple do frustrate, partly because it feels so natural to use the touchscreen instead of your smartphone, and you expect the smartphone's full functionality to simply duplicate in this new interface. We'd single out the refusal to integrate better navigation apps, to display texts and the lack of email access as the biggest drawbacks. But perhaps the Achilles' heel compared with existing automotive systems is the reliance on a data signal for both voice control and navigation. None of this ultimately proves CarPlay's undoing, but it does leave a lot of room for improvement. Like this? Why not delve into our feature on the future of in-car technology?